Back in April, we bought a brand-new stovetop smoker at an estate sale, complete with manufacturer’s literature and complementary packets of wood chips. Since then, I have spent a few months screwing up my courage to actually use it, but the sight of wood chips at three or more stores in the past few weeks made me determined to give it a shot, and for some reason, the whole rainbow trout at Whole Foods were just crying out to be smoked. It took some sweet-talking to convince my mom that we shouldn’t just get the trout filleted—she is still in that squeamish place I was five or six years ago—but eventually she agreed to bring home two big bright-eyed trout and a hunk of wild salmon. I chose to use a recipe from a book I got at that same estate sale, called Smoke & Spice, and a mysteriously named “burgundy” wood chip about which I could find no information. 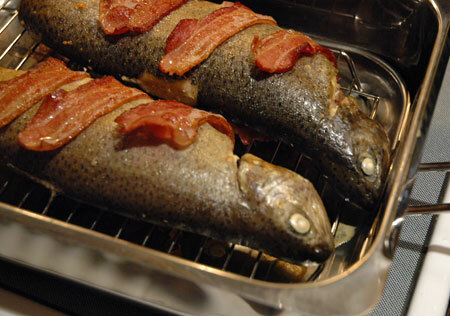 The trout was marinated in a garlicky brine, stuffed with a mixture of bread crumbs, green bell pepper, onions and chopped pecans, then wrapped in bacon and smoked for about half an hour. For me, the hardest part of cooking a whole fish is trying to serve it up. The thought of trying to cut bone-free fillets without causing the entire fish to disintegrate gives me heart palpitations, but I didn’t do too badly this time, I think. There were definitely bones to remove, but that would have been the case even with pre-cut fillets. 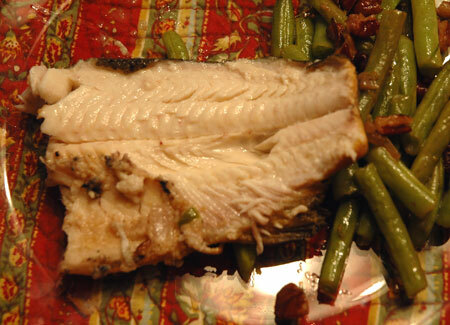 I served the fish over green beans cooked with pickled shallot and pecans to echo the nuts in the stuffing, but as it turned out, the stuffing was not exactly easy to remove from the cooked fish and mostly stayed on the cutting board with the bones. We didn’t miss it. The trout was so moist and delicately scented with smoke that I could have just had a plate of that and been satisfied—considering my fishbone phobia, that is high praise indeed. Even more impressive, my fish-phobic mother ate her entire portion and didn’t make any funny faces once she no longer had to look at the fishes’ heads. I didn’t make a note of the size of our trout but they seemed like large specimens, and we ended up eating only one between the three of us (Nolan declined our delectable dinner in favor of a peanut butter sandwich—his loss!). A few days later, I deboned the leftover trout and turned it into crispy little croquettes, moist inside just like they should be and chock-full of mildly smoky fish. 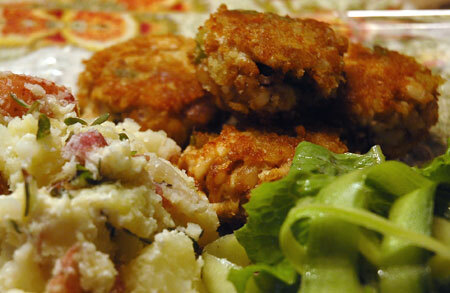 I served them with a dip of mayo, dried dill and pickled shallots (Have I convinced you to go make some yet? Go now…) and a simple salad of lettuce and raw zucchini ribbons dressed lightly with lemon juice and zest, dried dill, olive oil, a pinch of sugar, and some goat cheese for a creamy texture. I also made half-smashed red potatoes with butter, yogurt, and purslane—more on that last item to come!